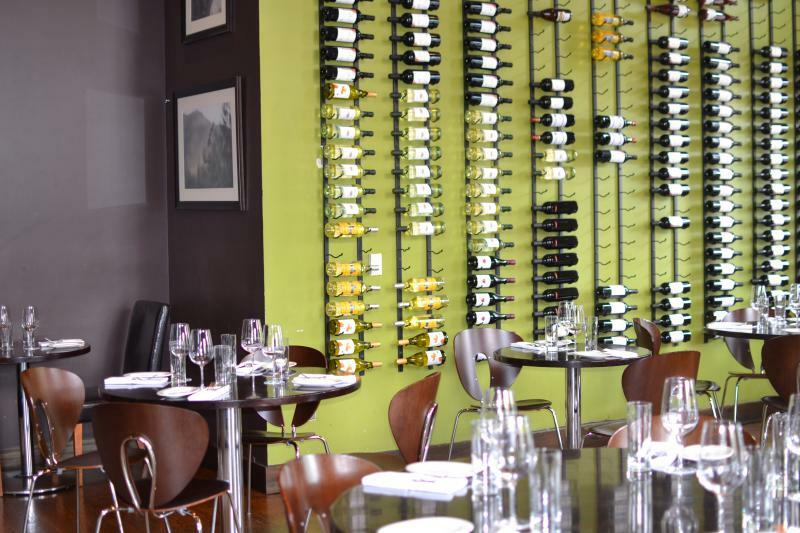 Since opening in 2006, Napa & Co. has received numerous accolades as one of the best restaurants in Connecticut with a creative and inventive menu. Co-Owner Mary Schaeffer told CTbites that her vision from the start has been the “wine country cuisine of Northern California…flavorful, fresh, simply prepared food with its roots based from the European influence of wine growers coming to the area from Spain, France and Italy over the last 100 years.” The restaurant prides itself on “blend(ing) the cultures” of various cuisines. Schaeffer also has a keen eye for culinary talent and last year she hired and handed oversight of the kitchen to Executive Chef Adam Truelove. Chef Adam earned a degree in Mathematics before following his culinary passion and enrolled at the French Culinary Institute in Manhattan. After graduation, he honed his skills at Town and Esca Restaurants before returning to the FCI as a Chef Instructor. He relocated to the Fairfield County area as the opening Sous Chef at Tarry Lodge in Port Chester, the Executive Chef at Pine Social in New Canaan and eleven 14 Kitchen in Greenwich as the Chef du Cuisine. Last year Napa & Co. reached out to Chef Adam and asked him to join its team to oversee the kitchen as Executive Chef. Over the last year at Napa, Chef Adam has slowly brought new recipes to the menu, added his personal touch to others and retained many of the dishes that regular guests have loved for many years. His vision is to deliver a menu with new twists on traditional cuisine and the dishes reflect a desire to complement rich meats and fish with a sweet and spicy elements. 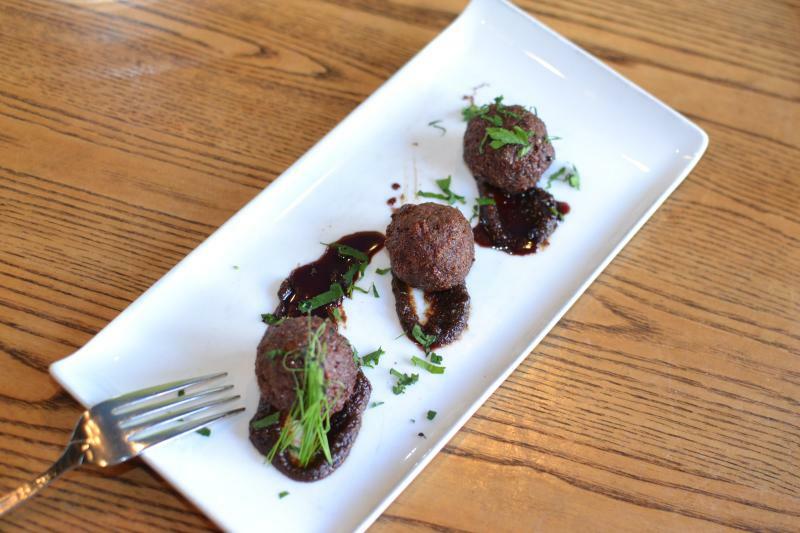 A staple on Napa’s menu for many years has been the “Duck & Foie Gras Meatballs.” Chef Adam slightly modified the presentation and the dish is now served with a cinnamon-Port glaze and a smidgen of fig jam. The flavor combination of the foie gras and the duck remains one of my favorites. The textural difference between the exterior and the interior the meatballs was divine. The meatballs were first flash fried and then finished in the oven creating a crispy exterior with soft and fluffy interior. The fatty richness of the foie was perfectly complemented by the fig jam and the concentrated Port glaze added a bold touch of additional sweetness to balance the entire presentation. 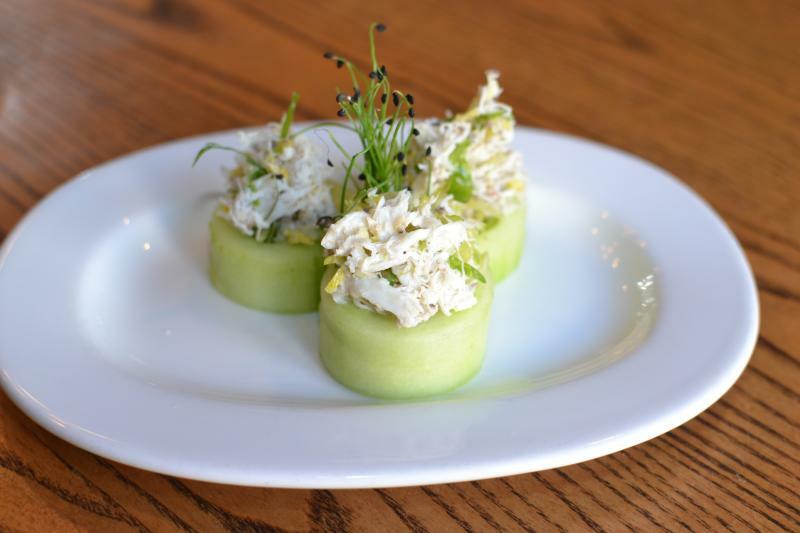 The “Crab Salad” included truffle and shaved broccoli and served atop thick slices of cucumber. The crab salad was very mild with two different and delicate components, the sweetness of the crab complemented by the earthy truffle. These light flavors were unfortunately overwhelmed by those of the cucumber, which became the focal point of the presentation. The dish would have been better balanced with more crab salad and a thinner slice of cucumber. 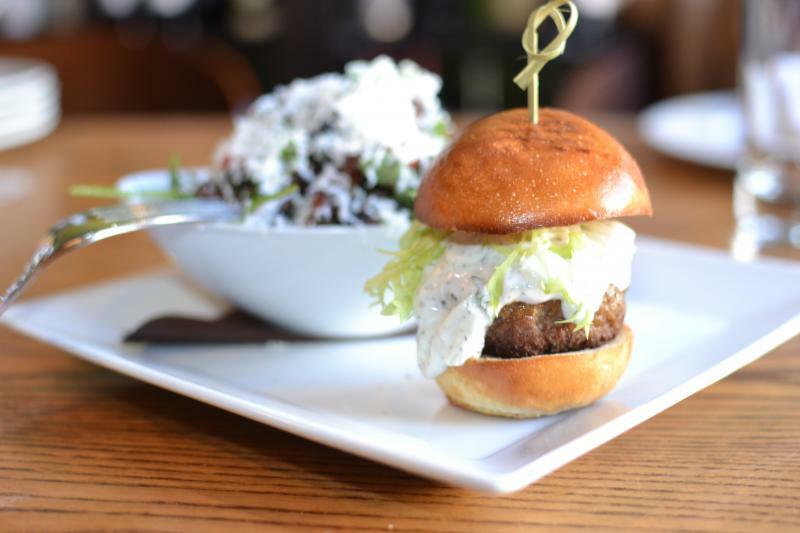 The “Lamb Sliders” were served with a honey-yogurt dressing and encased in a brioche bun, accompanied by a quinoa salad. The mini-burgers were delicious with the deep and rich gaminess of the lamb offset by the sweetness of the yogurt dressing. The buttery brioche paired perfectly with the lamb and honey-yogurt. The quinoa salad was dressed with a cumin vinaigrette and finished with grated ricotta salata. The dressing was applied heavily and overwhelmed both the quinoa and ricotta salata and less dressing would better showcase the nuttiness of the quinoa. The two entrées were both delicious. The “Roasted Atlantic Cod” was served with Bacalao whipped potatoes, roasted parsnips, lavender jus and finished with basil oil. This was a wonderful combination and offered two separate introductions of both the cod and the parsnip. 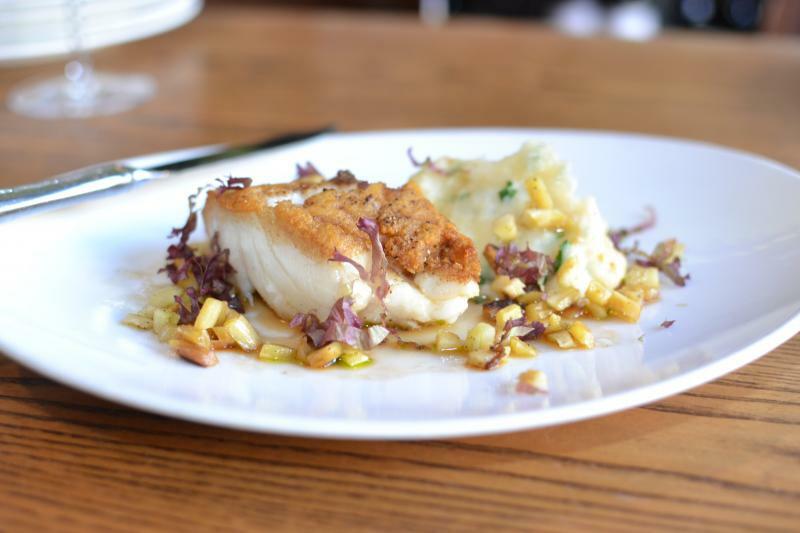 The filet of cod was perfectly seasoned and finished to medium rare, allowing the fish to maintain a soft and juicy interior, while the crispy exterior offered a delightful textural difference. The whipped potatoes included two additional ingredients, the Bacalao, which added a little fish background to the potatoes plus parsnip purée that created a touch of sweetness. Chef Adam then scattered diced roasted parsnip on the plate to add an addition layer of sweetness. 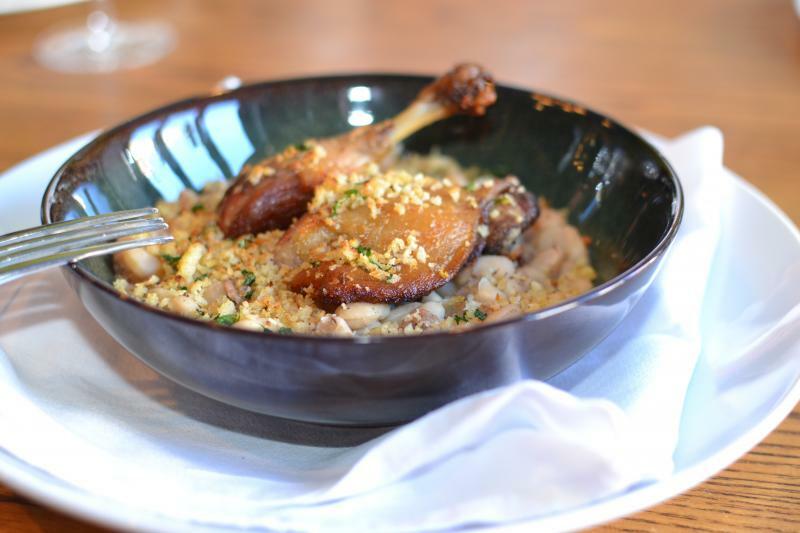 The “Cassoulet” was outstanding and one of the best versions I have ever tasted. This classical French roasted bean dish is traditionally served with roasted meats and Chef Adam’s rendition featured slowly braised duck confit. The duck was fantastic, soft and succulent on the interior with just a touch of crispiness from the roasting process. He added diced house-made wild boar garlic sausage to the beans to create bold accompaniment to the moist and tender duck. The beans were soft with just a slight bite in texture. To add additional texture, the entire dish was topped with panko bread crumbs before it was roasted. 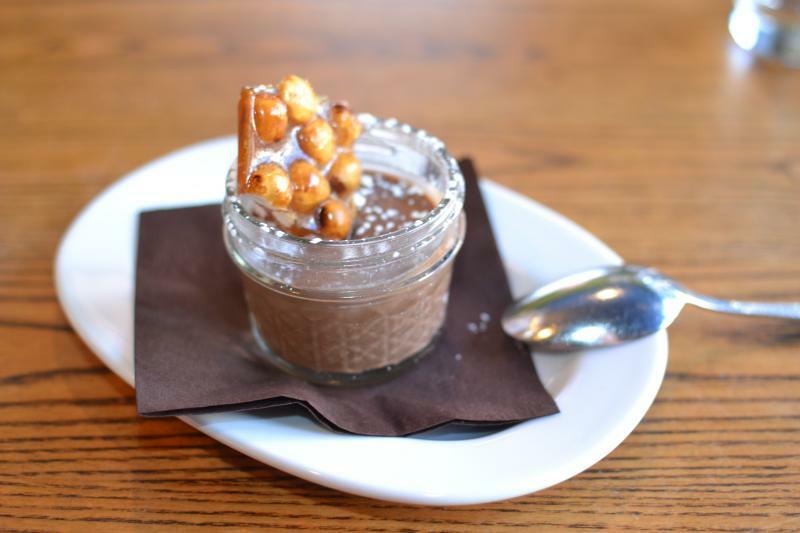 For dessert we ordered “Chocolate Hazelnut Pot au Crème.” This was served with a piece of grapefruit-hazelnut brittle. The crème was delicious, full of chocolaty goodness and the texture was mildly dense and pleasing to the palate. The brittle was a playful touch to the presentation. Chef Adam Truelove is slowly placing his mark on the menu at Napa & Co. As he moves into the spring season and includes fresh Connecticut produce I look forward to enjoying many of his additional twists on traditional recipes. This entry was posted in Stamford and tagged Adam Truelove, Jeff Schlesinger, jfood, Mary Schaeffer, napa & co. by jfoodeats. Bookmark the permalink.